We’ve been tent camping for 30+ years, both on the trail (backpacking) and in state and national parks (car camping.) This past year we also started going to local music festivals and fiddler’s conventions, where we set up our big REI tent, 10×10 foot pop-up canopy, outdoor carpet, chairs, etc. It’s fun, it gets us outside, and even an expensive tent isn’t that expensive. For most of those thirty years, we’ve occasionally seen a small, hard sided pop-up trailer called an Aliner, and we always said we’d get one eventually. Well, eventually finally came this year, so we went to the Aliner dealer and got a quote for a very nice one. Then some camping friends suggested that we check out a dealer who specializes in small campers, so a couple of weeks ago we ended up at Bumgarner Camping in Lenoir, NC, about 90 minutes from home. We looked a 15 different models from four or five manufacturers. The Cricket, from TAXA Outdoors in Houston, immediately caught our eye. The Cricket is tiny on the outside and big on the inside. With the roof popped open, I have plenty of room to stand up. It has a large bed that converts to a small table and chairs, a kitchen area with a gas stove top, hot and cold running water, a propane furnace, and lots of windows for cross ventilation and views. There’s a fair amount of storage under the bed, too. 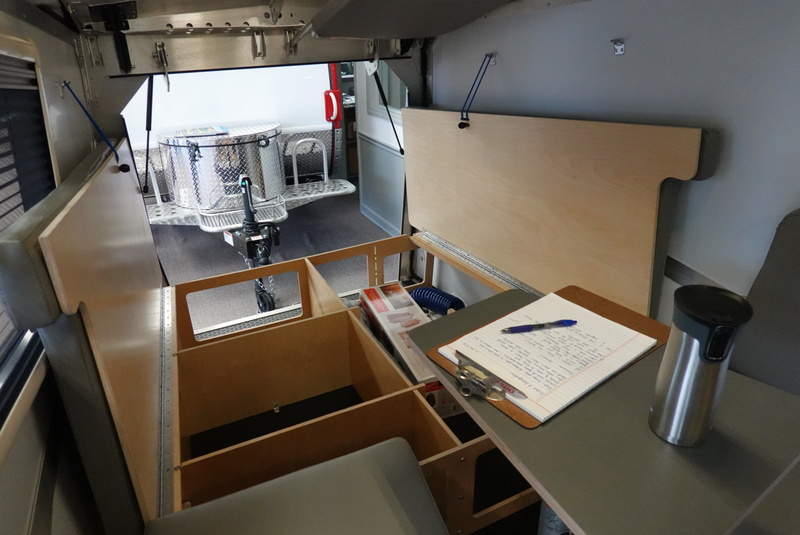 The interior is, to put it gently, “practical.” It looks like the inside of an Air Force C-130, all aluminum framing and panels and held together with bungee cords, carabiners, and clevis pins. There’s a reason for that — the designer, Garrett Finney, was a senior architect at NASA and worked on the habitat area of the International Space Station. The bed frame and the entire kitchen area are made from birch plywood and they look great. I feel that I can take the whole thing apart and put it back together — very helpful for repairs on the road. We bring it home in two weeks. More to come.